Omg is that a website link other than my DA? Why yes it is. I've been working on getting a website up for a very long time now and have finally managed to get it to a point where I can focus on content. So for the past month I've been attempting to slip in time to update the various pages plus organize and resize images. This is a hoodie commission for to go with his Ginijka Girafarig costume. Along with the hoodie I also offered to make the wallet chain to go with it. It is also one of 2 hoodies I managed to finish up yesterday and I plan on posting images sometime to day of the other one. At the moment I am currently closed for all character hoodie commissions. I will be posting on my journal when I am able to take on more. You should've made the tail too! 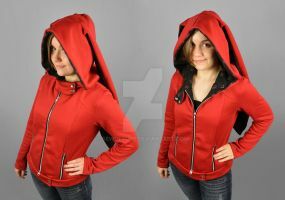 You should start a hoodie shop! And I was wondering...do you make ears and tails, too? how long do these usually take you?